The physics and physiology of gliding toward gold. The first gold medal of the 2010 Vancouver Winter Olympics went to Switzerland's Simon Ammann, who won the normal hill ski jumping competition on Feb. 13 with a top jump of 108 meters -- nearly the length of an entire football field. Athletes in this sport stretch for every inch they can, attempting to find the optimum combination of technique, body size, weight and aerodynamics. Sometimes they stretch too far -- damaging their bodies in the quest to become the perfect jumping machine. Luca Oggiano, an aerospace engineer focusing on sports at the Norwegian University of Science and Technology in Trondheim, explained that there are four major factors that enable jumpers to succeed: a stable position at take off, a high speed at the take off point, the position of the skis in the air (a V-formation is more efficient than parallel) and the shape of the body. Ski jumpers use their bodies and skis to create an effect similar to an airplane wing -- the most successful fly the farthest. "They are trying to play glider," said Louis Bloomfield, a physicist at the University of Virginia in Charlottesville who is interested in applying physics to everyday phenomena. "You push the air down, the air pushes back, pushes you upward." Coaches and competitors have found that lighter athletes tend to fly farther, despite the disadvantage that they are slower when coming down the ramp. In recent years, athletes have became thinner, perhaps dangerously so. Some have struggled with anorexia. In response, the International Ski Federation instituted rules aimed at discouraging athletes from competing at low, potentially unhealthy weights. Now, athletes with a body mass index below 20 must compete with shorter skis. BMI compares a person's height to their weight, so a jumper the height of 5-foot-8-inch Ammann can weigh no less than 132 pounds, boots and skis included, before incurring this penalty. Doctors generally consider adults over the age of 20 with BMI values below 18.5 to be underweight. The International Ski Federation maintains tables that provide the maximum length of skis for those with lower BMIs. A 5-foot-8-inch tall competitor with a BMI of 19 (weighing 125 pounds) would be limited to skis measuring about 8 feet 1 inch long -- almost 3 inches shorter than someone with a BMI of at least 20. "Cutting the skis is a good solution since the 'wings' of the jumper are reduced, leading to lower lift thus shorter jumps," said Oggiano. However, his wind tunnel tests showed that the ski length restrictions are not severe enough to overcome the benefits of being light. After the Olympics, the minimum BMI for International competition will be changed to 20.5. 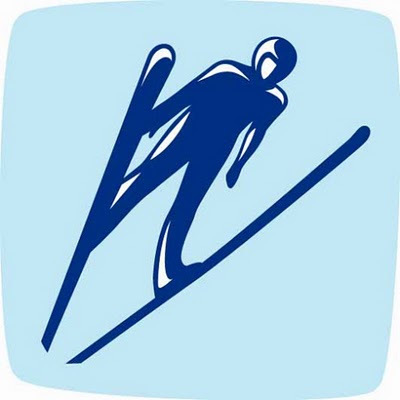 Youth events will continue to base ski length only on an athlete's height. Olympic ski jumpers will take flight in the qualifying rounds for the individual large hill competition on Friday, Feb. 19. With a longer ramp than the normal hill competition, jumpers gain more speed and soar even farther. The team large hill competition launches Monday, Feb. 22. As an ski fanatic and instructor physics in skiing are of great interest to me. I am surprised to find that the weight of the jumper has more bearing on the length of the flight than does the speed at which they take off. I've always wanted to try it... but it looks like I may be too fat to fly very far! Are there any special features to the clothes or the helmet to help them have a better motion or speed?